I came across this post I made on facebook in 2009. It was based on market wide quantitative measures I was looking at at the time. I could read the chart!! You were right! May I ask what mix of quantitative measures you used in order to make this statement at the time? @BJM, to be honest I don’t recall for certain. I believe I was looking at the betas of stocks to the SP500. Before that time they were all nearly the same at 1.0. But in March they were beginning to diverge. But like I said, I don’t recall for certain. A single sample, a record, does not make. 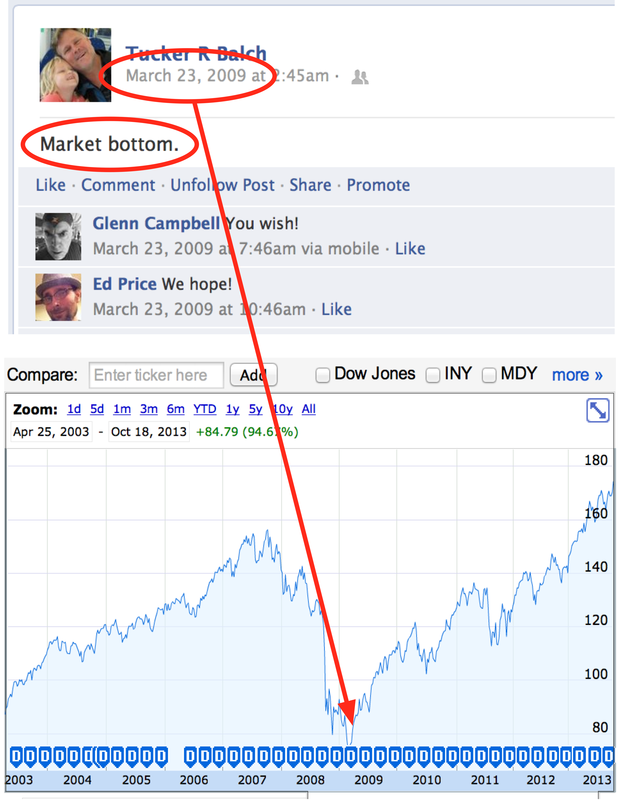 Did you predict the bottom at any other time yet were wrong? And what about your prediction of the top – which might have been even more impressive? We would have to see a continuous sequence of predictions to give you the title of Market Sage Extraordinaire.